by Gary Malkin, LincsMag Writer. 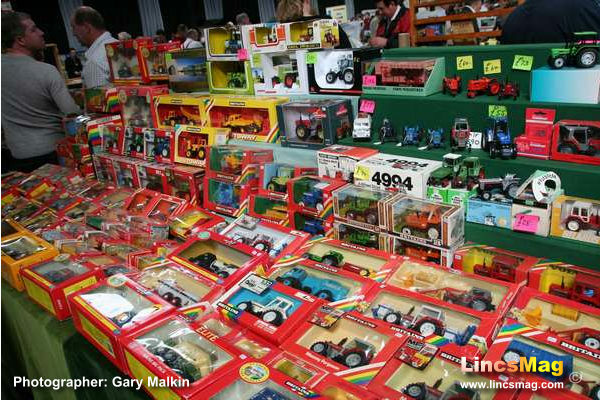 The first of the bi-annual model tractor shows was held at Springfields Exhibition Centre Spalding in April. The event is a showcase for agricultural and plant scale models and has been running since 1987. Now expanded the show also includes stands with agricultural books, old brochures and dvd’s while the show also now has a diorama competition. The popularity of the show is demonstrated not only by the queue waiting for the doors to open but also by the presence of most the UK’s major dealers along with an increased number from Europe. Most people will be familiar with the Britains range of tractor and agricultural models that have been the mainstay in the hi-street for decades but as this exhibition shows they are only a part of the industry. Whilst they concentrate on the current and more standard tractors in the popular 1:32 scale with minimal detail there are a host of other manufacturers that offer something different. The French company Universal Hobbies produce a lot of the more uncommon tractors to a high detail across three scales, 1:43, 1:32 and 1:16. The other name often seen in the hi-street is the German company Siku with their products again mainly in 1:32 but with less detail than Britains or UH. These were all to be found in good numbers around the show with the various vendors but there was also a number of cottage industry companies there that specialise in not only detailed models but also parts and accessories. You are able to buy anything you need to update or add more detail to your model from tyres to mirrors, aftermarket paint to correctly match manufacturer colours and decals for extra detail badges. With interest in diorama models increasing you can also buy a host of parts to build your own farmyard, barns, buildings, landscapes along with the figures to man your farm. Aside from the new models there is a large interest in the old ones too, some in mint condition in their boxes ranging to the well-played with models missing their parts, all have value to someone. Each show sees a special edition model produced that is only available from that show and this one was no exception. A limited run of only 50 Britains Case Magnum 340 models were produced with a transfer displaying the show logo and date. As with any hobby there are specialist magazines and one of the most popular, Model Farmer, is based at Saracens Head in Lincolnshire. They were at the show with a big presence offering back issues and subscriptions along with special limited edition models they have had produced. One of the Country’s biggest publishers of agricultural books and dvd’s, Old Pond were present. They were promoting their latest publication launched at the show, Farming in Miniature, covering the history and development in model tractors. Other specialist dealers were on hand with agricultural literature and brochures while Lincolnshire company Primetime Videos were showing their range of historical local agricultural dvd’s. The show was very well attended as ever with plenty of people going home happy with a bag or two of acquisitions. The next show will be held at Springfields on October 5th, further details can be found by visiting www.spaldingmodeltractor.com. To see more pictures from the Spalding Model Tractor Show 2014, visit the Album on our Facebook page HERE!